What is it and How it is Used? Radiotherapy (or radiation therapy) uses high energy X-rays to kill cancer cells. Normal cells are also affected but to a lesser degree. The dose of radiotherapy needed is calculated by a specialist, called a radiotherapist, and depends upon the size of the cancer, its characteristics, and also the reason for giving the radiation treatment (see below). The patient does not become radioactive after treatment! To reduce the likelihood of cancer coming back to the breast and armpit after surgery, i.e. to reduce the incidence of locoregional recurrence. To treat breast cancers that cannot be removed by surgery, e.g. large tumours, fixed to the chest wall and/or ulcerating through to the breast skin. To treat cancer deposits in the bones and brain. Will I Need to Have Radiotherapy? All patients treated by breast-conserving surgery (lumpectomy) for invasive or non-invasive breast cancer. Women undergoing total mastectomy whose armpit lymph glands (more than 3 glands) contain cancer. Women undergoing total mastectomy whose main invasive breast cancer extends to the edges of the wound site from where the tumour was removed surgically (called excision margins). Patients with large, inoperable cancers (radiotherapy may shrink the tumour down, making it suitable for surgery). Radiotherapy also seems to reduce the risk of cancer developing in the same breast in women undergoing lumpectomy for non-invasive breast cancer (DCIS). However, radiotherapy is unnecessary for patients who are treated by total mastectomy for DCIS. Radiotherapy to the area above the collarbone is recommended if the cancer involves more than three lymph glands in the armpit. Some patients with small low grade tumours especially if they are older than 70 years can be safely spared radiotherapy. After the oncologist has made the decision regarding the need for radiotherapy, the patient is invited for a treatment planning session. During this meeting, the procedure is explained and the patient’s questions are answered. Before the first treatment, the area of the body to be treated is marked with ink. Each radiotherapy session usually lasts for only a few minutes. The patient will receive treatments for five days per week over a 3-4-week period. Radiotherapy is not painful but it may make the patient feel tired. The patient may continue to work if she feels well enough. Changes in the skin colour over the treated area – it may become tanned, pale or red. Feeling tired or ‘washed-out’ – usually occurs during the mid-treatment programme and improves within weeks of finishing the therapy. Distortion of the breast at the surgical wound site – this is caused by tissue scarring owing to the radiotherapy. If the distortion is very severe, plastic surgery may be considered. Arm swelling (lymphoedema) – the risk is increased if it follows an axillary dissection. Inflammation of the lung (pneumonitis) – a rare problem and usually settles within a few weeks. Occasionally steroid drugs may be required. Whole breast irradiation (WBI) is the standard form of radiotherapy after lumpectomy for breast cancer. Accelerated partial breast irradiation (APBI) refers to the use of radiotherapy to treat the lumpectomy bed during or after breast conserving surgery for breast cancer. There is a growing body of evidence that APBI achieves excellent local control and cosmetic outcomes in early-stage breast cancer patients. 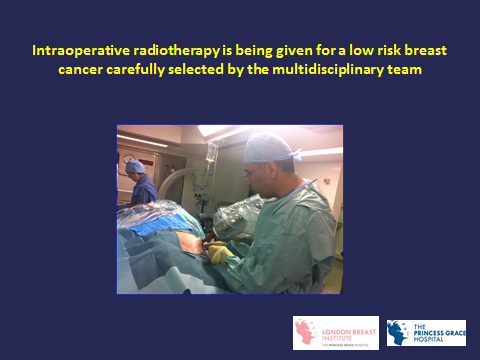 The author prefers the use of intraoperative radiotherapy of the lumpectomy site delivered by the mobile X-ray system Intrabeam™ (manufactured by Carl Zeiss, Germany) in a selected group of patients with early breast cancer. However long term data (>10 years) is still lacking.